Transparency Market Research (TMR) (www.transparencymarketresearch.com) has published a new report titled, “Medical Imaging Phantoms Market - Global Industry Analysis, Size, Share, Growth, Trends, and Forecast, 2018–2026”. According to the report, the global medical imaging phantoms market was valued at US$ 131.2 Mn in 2017 and is projected to expand at a CAGR of 3.6% from 2018 to 2026. Improved medical imaging using medical phantoms, reduced exposure to radiation and increase in efficiency of medical devices, and rise in adoption of advanced imaging methods are anticipated to propel the global market from 2018 to 2026. North America and Asia Pacific are expected to dominate the global medical imaging phantoms market in the next few years. This is attributed to the well-established health care infrastructure in the U.S. and the growing health care market in developing countries in Asia Pacific. The report offers detailed segmentation of the global medical imaging phantoms market. Based on device type, the X-ray/fluoroscopy phantoms segment dominated the market in terms of revenue, as these are the most widely used imaging systems, followed by ultrasound phantoms. Dominant market share of the X-ray/fluoroscopy phantoms segment is due to high usage of X-ray equipment in large as well as small health care facilities. X-rays are not only cost-effective diagnostic measures, but also have a wide array of applications in medical imaging. The nuclear imaging phantoms and CT phantoms segments are projected to expand at a rapid pace during the forecast period compared to the others segment. Increase in usage of novel advanced diagnostic tests such as PET and SPECT and rise in prevalence of various chronic diseases are anticipated to drive the nuclear imaging phantoms segment during the forecast period. The medical device companies segment accounted for significant market share in 2017, followed by the hospitals segment. Growth of the hospitals segment is attributed to the rise in incidence of various chronic disorders, ability of hospitals to provide optimum health care services to patients, and increase in the number of patients opting for treatment at hospitals supported by reimbursement programs such as Medicare. In terms of revenue, North America dominated the global medical imaging phantoms market in 2017. The region is likely to lose market share by 2026. 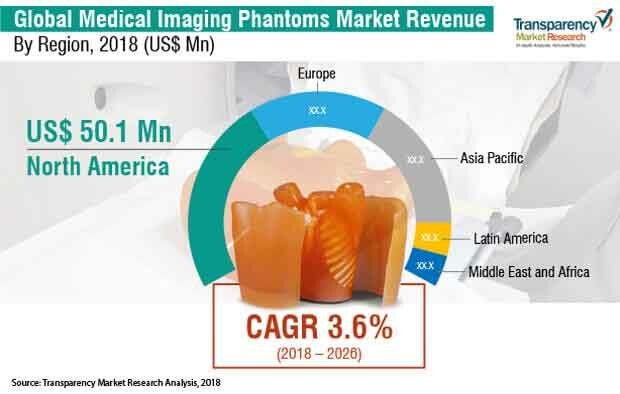 However, North America is expected to account for a significant share of the global medical imaging phantoms market in terms of revenue owing to the increased usage of highly priced advanced 3D printed phantoms in the region. Asia Pacific is projected to gain market share owing to rise in prevalence of chronic disorders and surge in awareness about medical imaging phantoms among the people. Rise in disposable income of people also contributes to the growth of the market in Asia Pacific. The global medical imaging phantoms market is dominated by a large number of private players. The report also provides profiles of leading players operating in the global medical imaging phantoms market. These include PTW Freiburg GmbH, Gold Standard Phantoms, Kyoto Kagaku Co. Ltd., Pure Imaging Phantoms, Dielectric Corporation, Modus Medical Devices Inc., Carville Limited, Computerized Imaging Reference Systems, Inc. (CIRS, A Castleray), Biodex Medical Systems, Inc., and Leeds Test Objects Ltd.